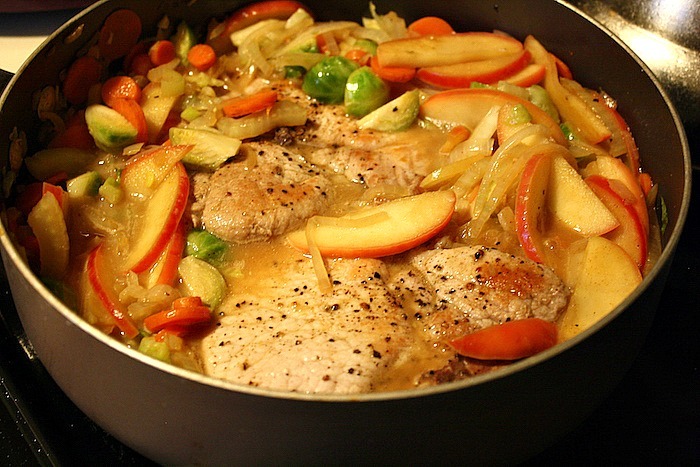 These Apple Veggie Pork Chops come together in a snap, so here’s what you’ll need: Apple Cider, Cinnamon, Cardamom, Cayenne Pepper, 1 Fennel Bulb, 2-4 Bone-In Pork Chops, 2 Apples (I went with Pink Lady), 2 T. Vegan Butter (or regular), 1 Onion, 2 Carrots, Coconut Sugar, 1 1/2 cups (approximately) of Brussels Sprouts, & Coconut Milk. 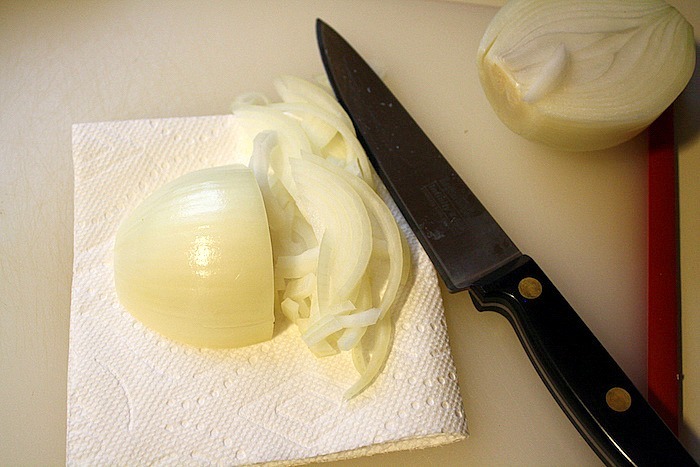 Get started on the Apple Veggie Pork Chops by chopping all of your veggies, so begin by cutting your onion in half and thinly slicing it. 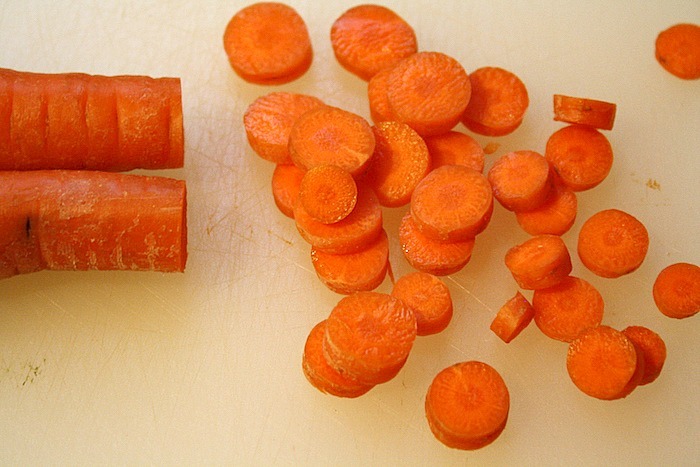 Then thinly slice 2 carrots, and I didn’t peel mine and just washed them really well. 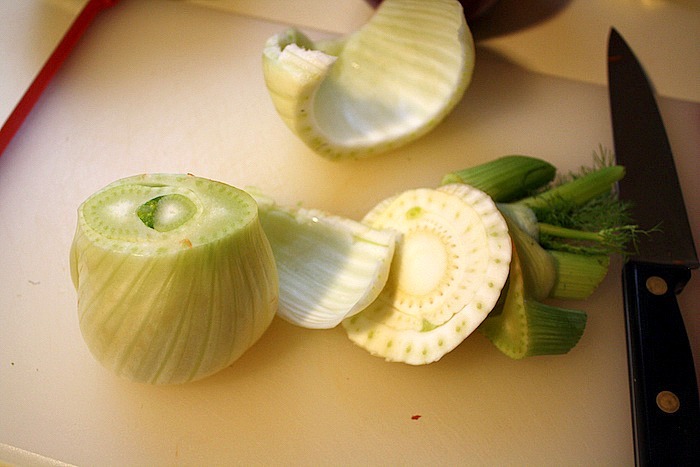 Now cut off the top and and bottom of the fennel and remove the outside layer. 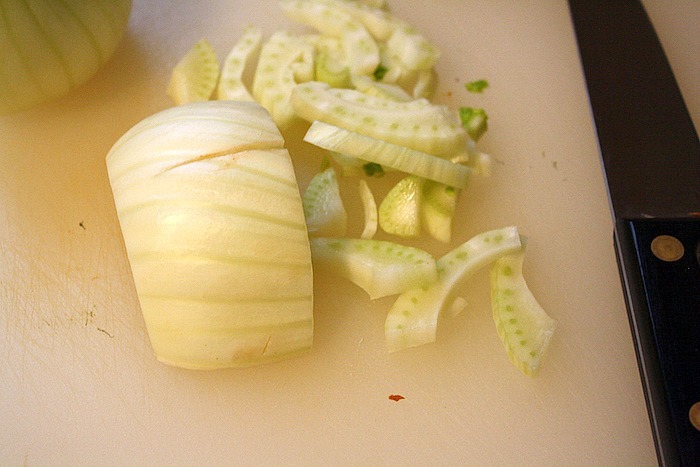 Then cut the fennel in half and thinly slice each half. Finally remove the core and thinly slice your apples, and then toss them with a little lemon juice to keep them from browning. Season one side of the chops really well with salt and pepper, and then heat a large pan over medium-high heat. Add one tablespoon of vegan butter to the pan, while the pan is hot. 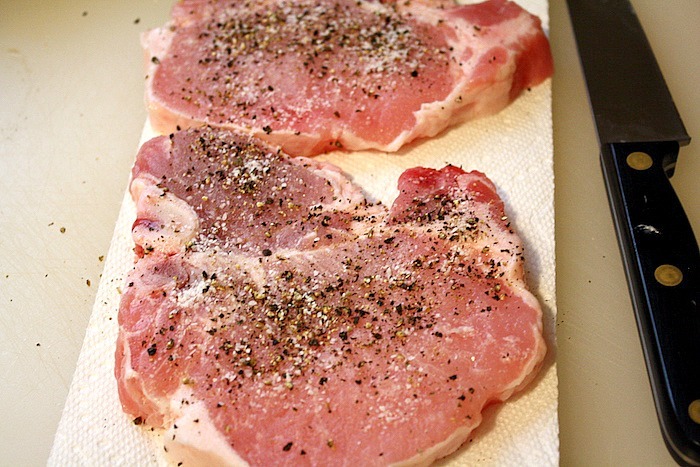 Then place the chops seasoned side down. Now season the other side with salt and pepper, and then cook for 3-5 minutes on each side or until they’re browned. Here’s how brown mine got, but you could always let them brown a bit more. 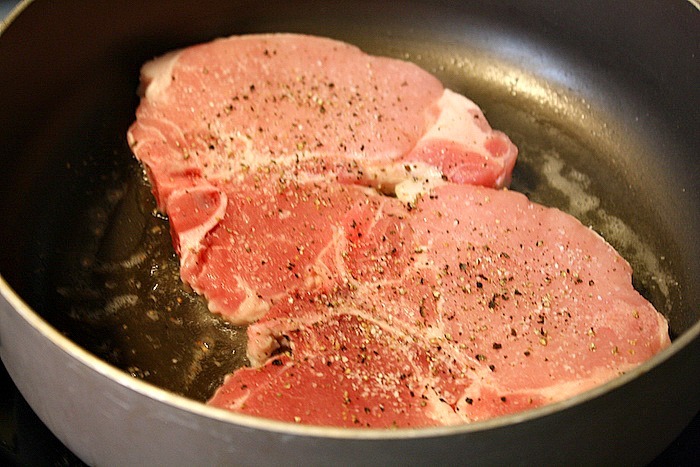 Once the chops are cooked, then transfer them to a plate. 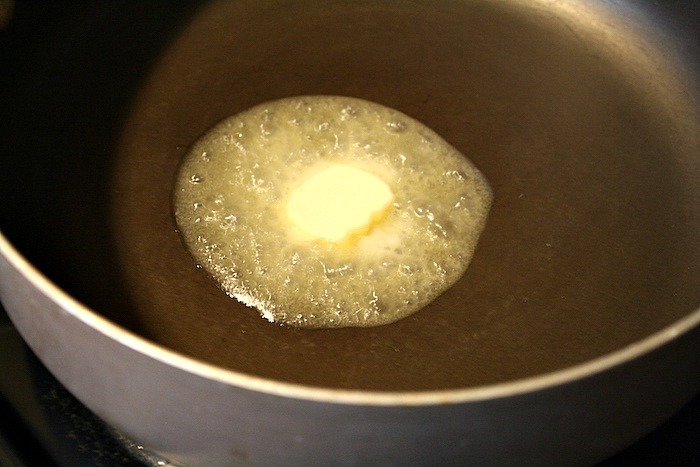 Now add another tablespoon of butter to the hot pan over medium-high heat. 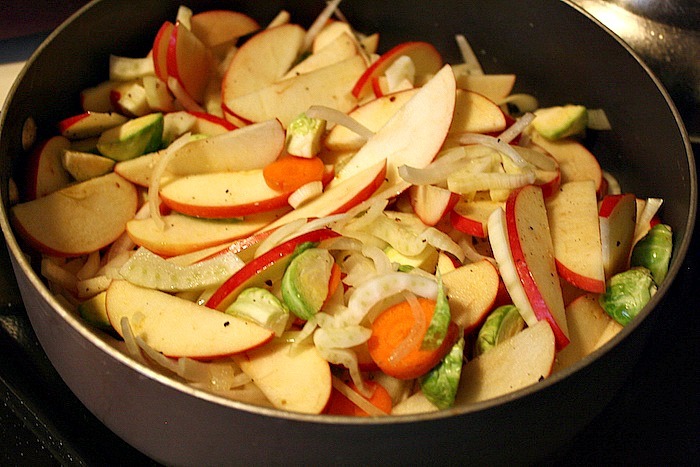 Now add all of the chopped veggies and apples to the pan and season with a little salt and pepper. Then use tongs and toss the veggies and continue to cook for 5-7 minutes or until the veggies are cooked through. 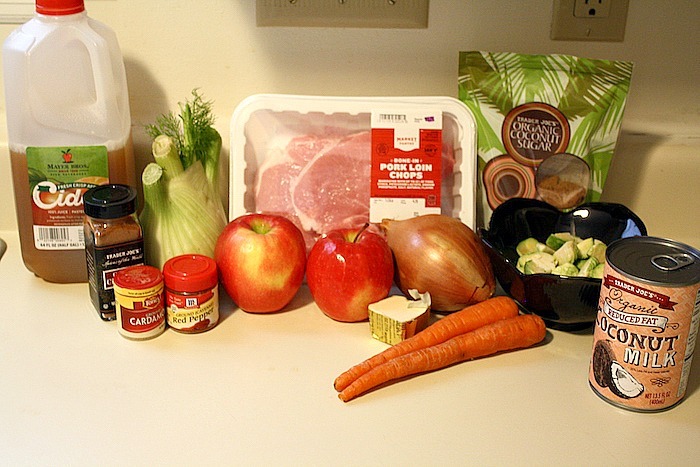 Now let’s add some flavor to these Apple Veggie Pork Chops in the form of 2 tablespoons of coconut sugar, 1/4 teaspoon of cayenne, and then 1 teaspoon each of cinnamon and cardamom and toss well. Then add about 1 cup of cider and 1/2 cup of coconut milk or enough liquid that the chops will be able to sit in the liquids. 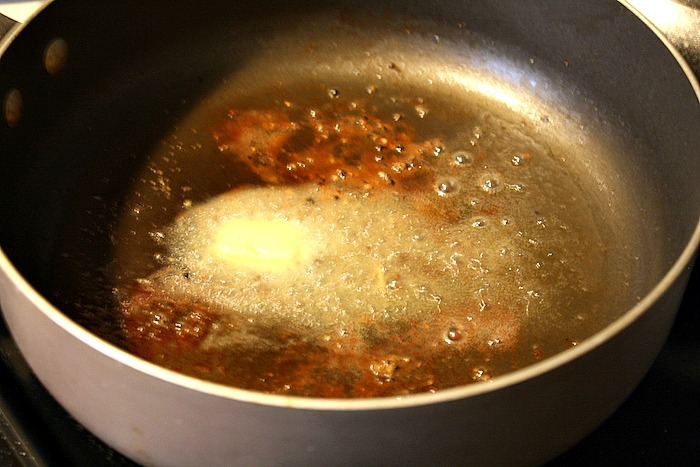 Then add the chops to the pan so they submerge a bit, and let them cook 3-6 minutes. You’ll want to check the internal temp so the pork is 145 degrees for a pink color and then up to 165 if you want it well cooked. I opted for 150 degrees, and it was perfect! 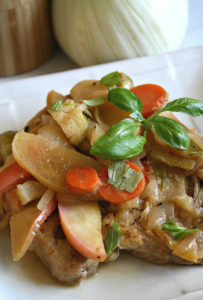 These Apple Veggie Pork Chops are going to be a total hit, so eat them right away and happy pork cooking! 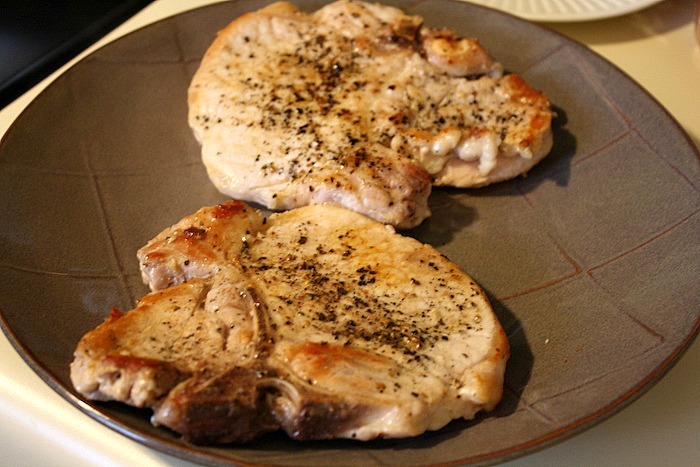 These pork chops are tender, juicy, flavorful, and super easy to whip up anytime. Enjoy! 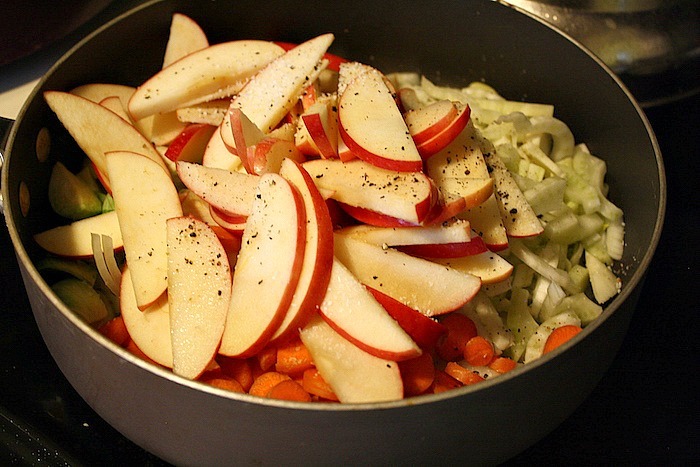 Begin by chopping up all of your veggies and the apples, so that they’re waiting on you. 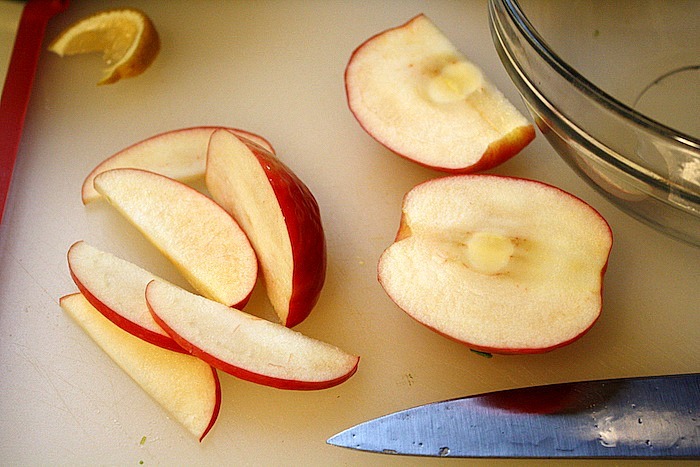 A tip with the apples is to toss them with a little lemon juice after they’re sliced so they don’t turn brown. Then season one side of the pork chips with salt and pepper, while you heat a large non-stick pan over medium-high heat. Add 1 T. of vegan butter to the hot pan, and then place the chops in seasoned side down once the butter has melted. 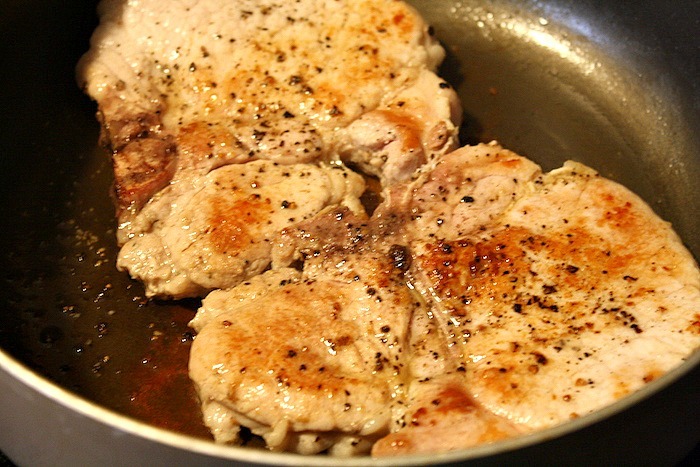 Season the other side of the pork chops, and then cook them 3-5 minutes or until they’re browned on each side. 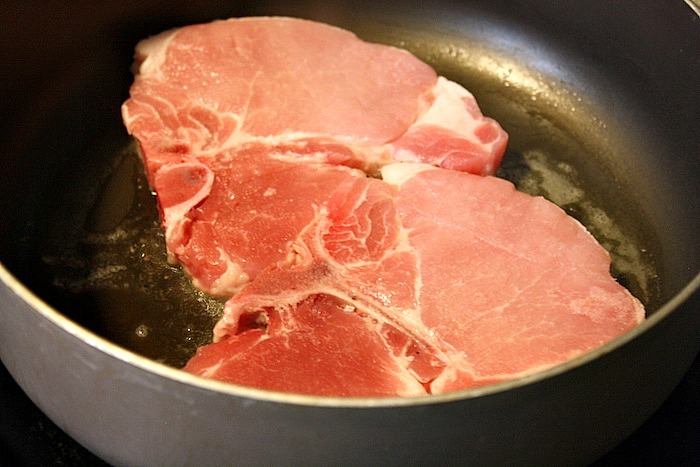 Transfer the browned chops to a plate. Then add another tablespoon of vegan butter to the pan over medium-high heat. 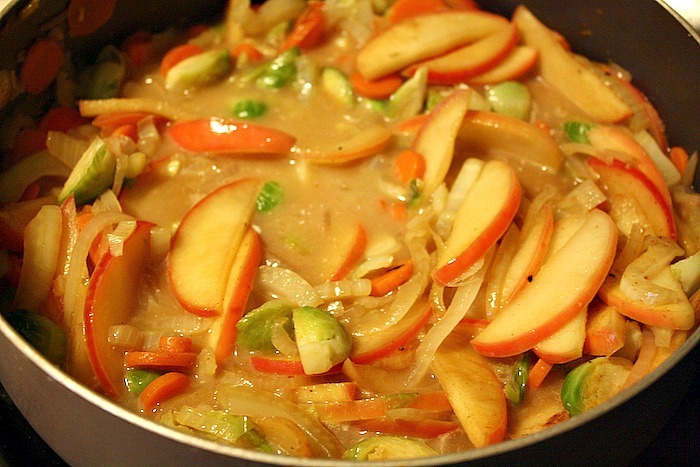 Add the onion, fennel, carrots, Brussels sprouts, and apples to the pan, and then toss every minute or so for 5-7 minutes or until the veggies are cooked through. 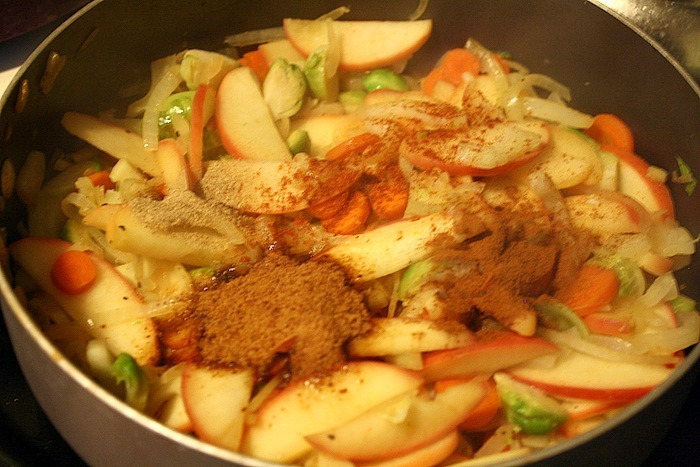 Now add the coconut sugar, cinnamon, cardamom, and cayenne to the pan and toss the veggies and apples with them so they’re coated in the spices. Then add the liquid including about a cup of cider and 1/2 cup of coconut milk or enough so the pork chops will have some liquid to submerge. Then place the chops back in the pan and let them cook in the liquid another 3-6 minutes or until the internal temperature is 145 degrees for some pink or 160 degrees to be fully cooked. Remember that pork is totally safe if it’s a little pink, so I went for about 150 degrees. 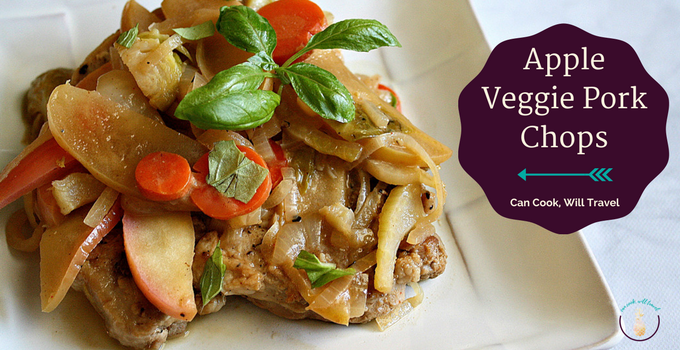 Serve the chops topped with the apples and veggies, and then enjoy right away! Quick Note: It's up to you and how many people you're serving on the amount of pork to use. I had 2 large pork chops that I got 4 meals out of. But you could also get 4 smaller pork chops as well.